Zerto in my opinion are in a great position to help customers on their journey to the cloud, allowing customers to start by subscribing to a DRaaS offering from over 350 cloud providers and then further allowing them to pivot production into the cloud whilst maintaining the resilience their business demands. Furthermore ensuring you are not locked into a cloud platform is an important aspect to consider, with version 6 and the ability to replicate from one public cloud to another offers customers piece of mind if they wish to move in the future. Multi-cloud mobility - Expanding the bi-directional support, ZVR 6.0 enables customers to mobilise and protect applications and data between Azure, IBM Cloud, AWS and more than 350 CSPs. With inter-cloud and intra-cloud mobility across multiple cloud environments, Zerto makes it easy for businesses to be fully protected, while mobilising applications and data workloads to, from and between multiple clouds. This capability provides full and complete public cloud-to-public cloud disaster recovery and prevents organisations from being locked in to cloud vendors. Enhanced data protection - ZVR 6.0 includes enhancements to long-term retention that reduces the dependency and expense of using traditional backups for protecting workloads. Specifically, enhanced journal file level restores support file-level recovery in both Linux EXT and Windows file systems which equates to faster restore times. Combined with Zerto’s continuous data protection, replication and automated orchestration, customers now have the flexibility to rethink their data protection strategy to reduce costs and complexity, and increase productivity. Visibility through analytics - Zerto Analytics has been enhanced in ZVR 6.0 to give customers visibility into the health and compliance of protected multi-site, multi-cloud environments. Enhancements include expanded dashboards with new live network analysis reports for troubleshooting and optimization, insights into network throughput and performance, the ability to monitor site-to-site and outbound traffic and 30 days of network history metrics for any site. 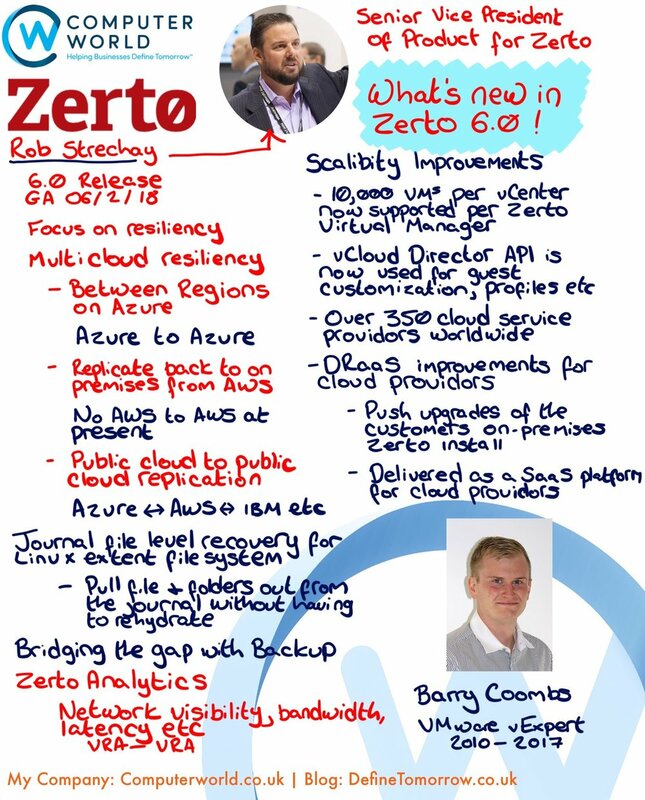 Cloud manageability for CSPs - ZVR 6.0 includes enhanced support for CSPs who offer DRaaS by adding a new service - the Zerto CSP Management Portal. Through this portal, CSPs will be able to remotely upgrade customer sites to provide them with continuous availability and latest software releases.